The pictures are done, the gathering, the ceremony and the party are over. Here you are, holding a beautiful and special piece you want to keep and take care off. 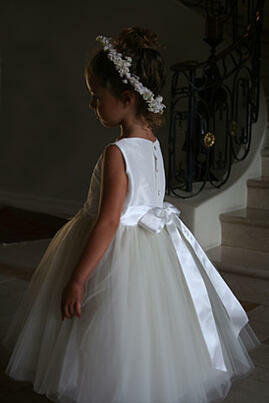 Be this a Christening Gown or Blessing Gown, a Flower Girl dress, or a Wedding Gown. You are thinking they may be other occasions, someone in the family will use it, or your child’s child may wear it in time. The issue is how to do it? Light – Low light levels are preferable for storage. Sunlight and fluorescent light are specially damaging. Humidity & Temperature – Moist air, (over 60% humidity) warmth & lack of air circulation encourages mold, stains & deterioration. Basements and attics may provide extreme fluctuations in humidity levels, which is to be avoided. Plastic bags can trap humidity & result in mildew. 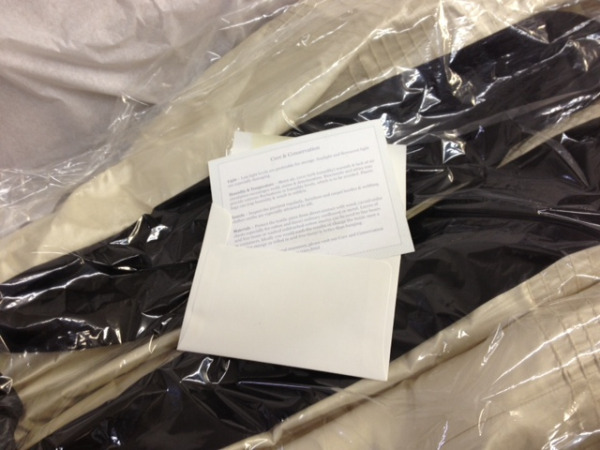 Insects – Inspect the garment regularly, furniture and carpet beetles & webbing clothes moths are specially attracted to silk. Materials – Protect the textile piece from direct contact with wood, (avoid cedar chests especially for cotton and linen) ordinary cardboard or metal. Layers of acid free tissue or unbleached cotton muslin can be used to line boxes or containers. Ideally, wash the muslin or change the tissue once a year. Flat storage or rolled in acid free tissue is better than hanging. If you want more information or details on how to storage your heirlooms safely, we have compiled a list of additional resources you may want. If acid free tissue is not available. Replace with white tissue & renew every year. Archival boxes (acid-free) can be purchased from conservation supply businesses. Bachman, K. (ed.) Conservation Concerns: A Guide for Collectors and Curators. Washington, DC: Smithsonian Institute Press, 1992. Keck, C.K. Care of Textiles and Costumes: Adaptive Techniques for Basic Maintenance. Nashville, TN: American Association for State and Local History (Technical Leaflet 71). Have you felt the frustration of doing or seeing a sloppy bow on a gorgeous girl’s dress? There is no doubt we are all dressing more casually and the opportunities to learn how to tie a bow are fewer and fewer, elegance is often a Special Occasion subject. This fact became apparent recently when I attended a wedding. Four adorable flower girls were coming down the aisle. The bride selected the dress 'Surprise' from our Special Occasion Collection. This dress combines an embroidered organza overlay and silk dress, the girls looked beautiful. I was feeling pretty good until the girls passed me. Looking at them from the back, it was obvious no one getting them ready was comfortable tying bows; some bows were loose, uneven or going in the wrong direction. After a lifetime designing special girl’s dresses, tying bows for hundreds of photo shoots on girls of all sizes and ages means tying bows is something I really know about! We decided to create a graphic with simple steps that, with a little practice, will deliver a perfect bow. With one ribbon in blue and one in pink, it is easy to follow. We printed it to include it in all the Special Occasion girl dresses we ship at this time of the year for First Communion, Flower Girls, and Graduations. 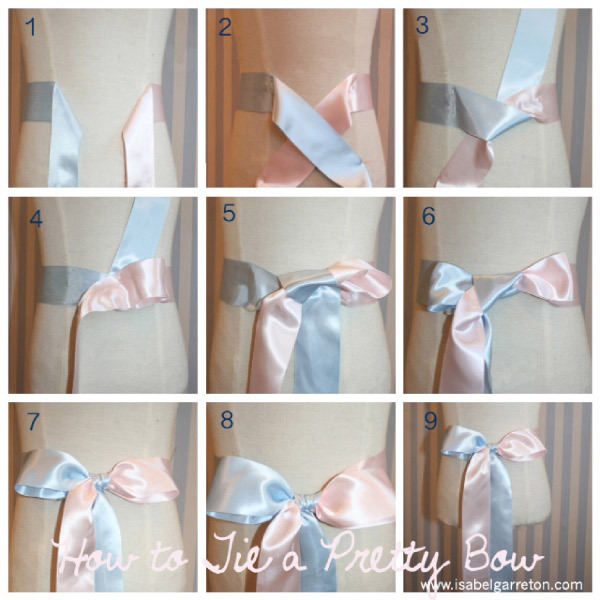 It is useful to know how to tie a pretty bow, a simple and handy skill to have when you need it. It takes just a few steps and a little practice… Ready?...Try it. The length of the remaining ribbon should be at least twice the width of the complete bow. I have seen them longer and sometimes in organza shorter. They all looked beautiful. 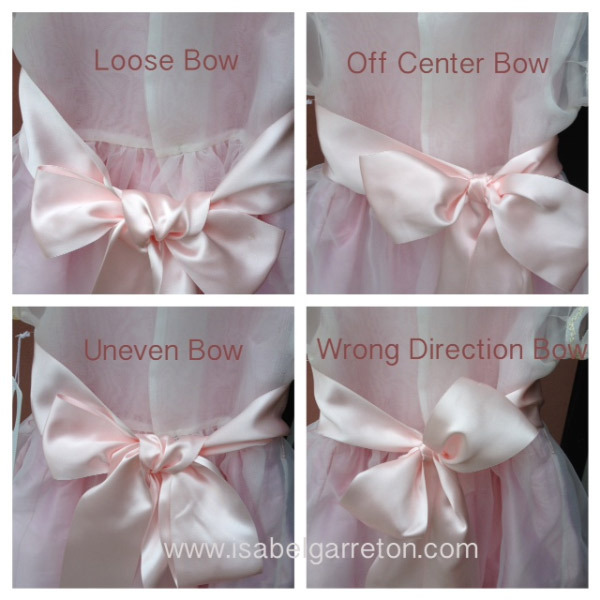 If you have a different way of doing bows that works please share it, we’d love to try it. Getting ready for a memorable event? Take a peek at our Special Occasion Designs. 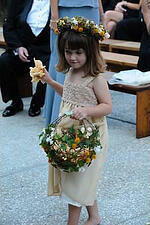 1) Take a few minutes to be with the flower girl while you’re dressed as the Bride in your full gown and makeup. Ask if you can help her prepare the petal basket. Brides look like a beautiful princess to a little girl and it's a magical moment for them and you. It will make her feel like she is a part of something important and you'll get great pictures for your photo album. 2) Have a Plan. 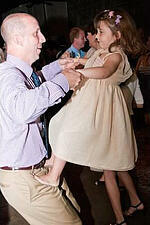 Ask your flower girl's mommy to please come early before people arrive. The flower girl should practice walking down the aisle and be given very clear simple instructions like, “walk right along this crack”. Give her a lot of positive reinforcement. If you give her a destination, she'll have something to focus on, especially if the eyes of all your wedding guests make her nervous. 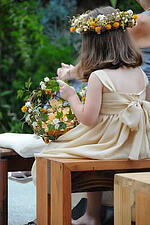 Some brides have the flower girl put her basket on a pedestal just to the side of the ceremony or seat her parents in the front row just to the side of the family and seat them there for the rehearsal too. If you are going to have music as she walk down the isle, try to have it play at least once in the practice so as much of the experience can feel familiar when the wedding begins. 3) Be Flexible. While many people will say to you "It's your Day," in a child's mind every day is their day! If they don't want to wear their hair the way you dreamed, or keep taking off the perfect shoes you picked, try to let it go. In the end, she'll be beautiful no matter what and you can crop bare feet out of pictures, but you can't take a scowl off her face. 4) Two by Two. 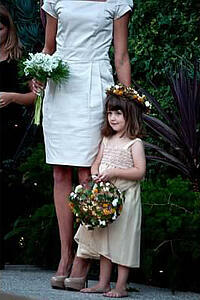 If you have multiple flower girls, pair them with a girl a few years older to walk together. The older girls can help guide younger girls. Have them hold hands at the beginning in case they get jitters and have them play games or share toys ahead of time so they feel comfortable together. 5) Reward Her. If you provide something fun to distract her, like coloring books and crayons wrapped up like a gift, it'll help keep her amused throughout the reception and give her parents a chance to eat dinner. For this wedding it was a yoyo and some fun plastic hair clips. 6) Let kids be kids. Once her official duties are over, dance with her, let her run around, give her a piece of cake if she is still awake! If it's all too much, the bridal suite is usually empty during the ceremony and reception, so it works great as backup plan with PJs and a blanket for a sleepy little girl. 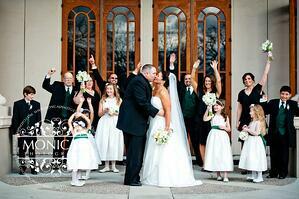 Your wedding will be filled with wonderful memories with friends and family. 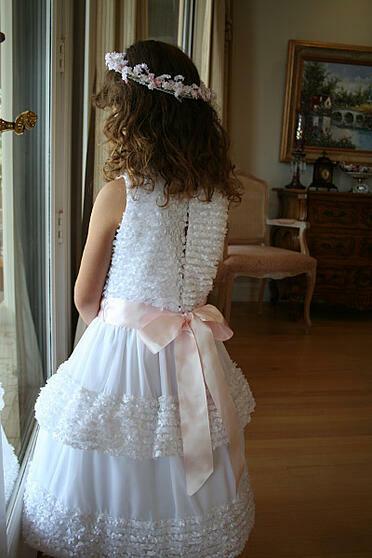 With a little planning, your flower girl will also have wonderful memories as she imagines becoming a Bride someday! 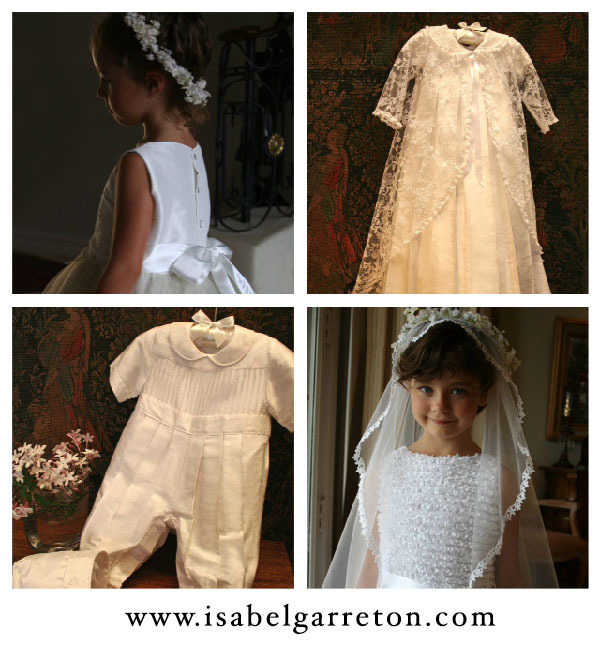 Share your Isabel Garreton flower girl pictures and memories with us on Facebook, Twitter, or Instagram. 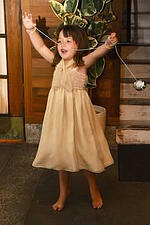 Looking for the perfect flower girl dress?